Thanks For Reading! 80 Million Visits and Counting! Saber Lily from Fate/unlimited codes. Another seven months, another ten million visits. I’ve had the pleasure of writing three of these milestone posts, which allow me to take a moment to thank you all for reading the site regularly and sharing your thoughts about anime. I said before that Random Curiosity wouldn’t be what it is today without its readers and I firmly believe that even now. I can’t speak for all the other writers, but I know I wouldn’t be devoting as much time and effort into the site if it wasn’t for its readership. While I’m passionate about anime and enjoy talking to those with a mutual interest, the motivation to continually push myself to churn out well-thought-out posts in a timely and consistent manner comes from all of you. I mentioned before that one side drives the other, and from my perspective, it’s the readers who shaped Random Curiosity into the anime blog you see today. The reason I spend so much time taking screen captures and writing up posts is because there are people who want to read them. Without you guys, there’s simply no compelling reason to cover shows on a weekly basis to the degree that RC does, let alone spend hundreds of hours putting together season previews to introduce them. I probably don’t say this enough, but I’m very grateful for all the support I’ve received in the comments and direct e-mails, and all the personal time the other writers have devoted to help meet reader demand. I have to confess that there were several occasions in the past year that I thought about hanging up the blogging gloves, going all the way back to the spring season that I took off. It had already been a year since I took over Random Curiosity, during which I found myself continually trying to find ways to improve the site and help its community grow. You can chalk that up a combination of ambitiousness and a desire to prove naysayers wrong, but regardless of the cause, it was a far cry from simply keeping the “spirit” of the site going and blogging anime at my own leisurely pace. I enjoyed the challenge and found it a rewarding experience, but when it started requiring more time than I had to spare, I found myself at a crossroads. The real reason behind my post in May was not to stroke my ego, but to assess whether readers were happy with how the site was running in my absence so that I could potentially be away from it for extended periods of time. There was naturally a slight drop off in visits because less shows were being covered; however, even some of the popular offerings didn’t seem to generate much discussion anymore. I figured it was simply due to less interesting shows compared to the winter season, but was concerned about the state of the site. To this day, I still don’t know what to make of the poll results because of the choices I used, as the drop in readership carried over to the early parts of the summer season. At that point, I started to wonder if it was time to take an indefinite leave from blogging, or at the very least, an extended break until I had an urge to blog regularly again. Well suffice to say, that didn’t happen, as you guys will never let me off the hook it seems. Alongside Prooof and Takaii who continued to plug away and Enzo who joined the site that season, the readership not only rebounded, but also set record highs with the start of the fall season. Who do we have to thank for that? The readers of course. So on behalf of the other writers and myself, I’d like to thank you all for making this one of your regular stops on the Internet, and motivating me more than you’ll probably ever realize just by doing so. Congrats as well this year! That aside, can anyone link to the Saber Lily picture that is on the banner? Congrats guys. I know I don’t comment around much (the odd one or two here and there) but it’s always the first place I visit after coming home from work to see what you guys have written about the shows I’ve been watching and to see what other people think via their comments. It’s always a pleasure to visit and I appreciate the time you and the rest of the bloggers put into making this place just what it is. Cheers, and here’s to your next 10 million! Congrats, RC has changed over the years. Your doing a great job with all the new additions. Like the above comment I always visit here to see the updates. Thanks and hope we get a billion. I wonder if anyone else did the same thing? Thanks for all the hard work and long nights, because even if the readers are your reason for blogging, you writers are the reason readers come here. Before RC i didn’t even watch ongoing anime, i preferred to “marathon” anime so I can capture the whole story in one go. This often meant not watching anime for several seasons to a year. But then I found Best Anime of the Year posts, read those, found this website, and now I’m following 15-20 anime a season. The posts are addicting, haha keep up the good work RC. Take Pride in your work. First of all thanks to Divine and all the writers (Takaii, Guardian Enzo, Proof and the two guests actually) for continuing this great blog that left Omni and keeping it alive because as many here I often (3 to 4 times a day) visit not only to read the comments from the main bloggers, also from the people that also reads the posts and comments because here you can talk about what you see and what others saw in the same episode and you may have overlook and that chance you cannot have it usually with the people closer to you (you know different interests) but here there’s a community. And for all of this thanks to all who writes in RandomC and all who commment. When I see posts like this, it compels me to stop lurking around on this site and give a (more than)well-earned thanks to everyone who makes random curiosity the awesome blog it is. Thanks guys, and hugs from Belgium. You guys have been doing an excellent job. This is the first anime blog I reference for new shows and discussing the latest episodes. It’s been like that for years. On a side note who’s the character on the post and banner? Well grats on that achievement. I always visit this site because you guys cover a lot of anime so it helps me keep track to what to watch out for. Keep up the good work! Congrats guys. I still love this site. Congratulations to everybody! ^_^ I’ve been following this site for more than 4 years now and I’m extremely grateful to Omni for starting it but especially Divine and the rest of the current writers(proof, kiiragi, takaii, and guardian enzo) for keeping this awesome site going!!! Congratulations, you guys have consistently done a wonderful job on this site. I don’t think you should worry about last season’s low visits too much; because I think you’re right about it having a lot to do with the inherent popularity of the things being animated during any given season. Well said Divine and I’m glad to see that this season received so many visitors. Long live RC! Random Curiosity is what brought me here, and Random Curiosity is here to stay. CONGRATS RC! LONG LIVE THE KING! I’ve been following you as long as I can remember watching anime. Although I kinda miss the old louise header, you guys are still one of the best episodic anime blogs. Congrats! I would be so lost on all things anime without RC so thanks to all the writers and divine for keeping this site going strong. Grats! Keep up the awesome work! Don’t think about hanging up your blogging gloves again until you are super old and can’t type anymore. I really love this site and how it does season previews. I don’t know how I’d even keep track of all the animes that get released without this site leaving me missing some very awesome new releases. Just keep it up and this site will become even a bigger hit than it already is. 80 million… such an awesome number. Big congrats on the milestone! I don’t comment much, but I come to the site every few days. Love the layout….the screencaps, and the commentary. I’ve been a visitor for quite a while. Love the site, and hope you guys keep it going. Thanks for all the time you put into it. Congratulations to RC! Let’s go to the 100 millions visits! In 7 months since the last milestone you racked up 80 million post. Keep this up and you’ll get 40 million more in the middle of Winter 2012, supposing were still around. If Omni ever visits, I bet he’d be proud. I’ve been an avid reader of RC since those days, and will continue to be in the years to come. Thank you all for the hard work and dedication you put into making the anime discussion world more interesting. At first, I started reading and was hoping that it was not another “Omni’s reflection -> retirement” scenario. You can’t imagine how big of a relief I felt when I finished reading your post, Divine. Still! O_O 80 mil! and going too! Ya’ know, looking back…my visits to RC dropped during the last two seasons – it wasn’t the quality of the blogs from the bloggers themselves, but simply that of quality of the shows. I wasn’t motivated AT ALL in watching them. BUT this season…I practically check RC the minute I get online everyday. So don’t worry too much Divine. I’m so relieved this wasn’t a retirement post…whew. Divine and all writers, please pace yourself, so you don’t burn out. It would be such a loss to the anime community to lose this site. 60 – 80 million is a giant step. Its gratifying to see after so many years, Random Curiosity stands the test of time. Thank you so much for all your efforts to inform us of the latest goings in the anime world, as well as showing such deep thoughts. To the 100 million marker! You’ve been a truly worthy successor to Omni. Thank you to you and the other writers who have kept Random Curiosity going. graaaaaaaaaaatz and keep up the great work everyone! Congratulations! I’ve only been visiting Random Curiosity since the last few months of when OMNI was blogging on it. So it has been quite a long while that I am a long time reader/fan. I do occasional comments on some episodes of the anime I like to watch, but I viewed other posts just out of curiosity as well. This is a great site and to keep this community alive on the internet takes a great deal of effort and time. And for that I’m very much grateful to all the writers for their daily input and passion to this special blog. You all made RC a legacy to remember if not appreciated IMO. Thank you guys again and please keep up the awesome work. Random Curiosity NOW AND FOREVER! Congratulations on the milestone! Have been a long time reader since the Omni days and can count the amount of comments I’ve done with one hand, but as a proud member of the RC lurkers, would like to thank you and the team for the long hours and hard work put into this site! Don’t worry too much about the traffic stats – they don’t reflect the great work you guys do, but moreso the quality of the content on offer each season. You will still be the first place I look for new shows, as it has been for many a years past now. Congrats on another huge milestone! Thanks for your hard work. You always have such quality material on this site. It’s so much fun watching anime along with this community. I heart RC!! Gratz guys, you are awesome. Congratulations you guys. I know I’m not a regular commenter, but your site is very much a part of my anime viewing experience, as I simply must read your opinions of every episode of the series I’m following. As such I am eternally grateful. Thank you so much for all the effort you’ll put into this site, and once again congratulations on another huge milestone! And here’s to the next big one! Congrats. Love the new banner. Allow me to join in on the love-in bandwagon by offering you guys my sincere congratulations. I’d say you deserve it. Long live RC! I think that since Divine has taken over, the already great blog become even better. RC is so good, it’s my one stop blog for all my anime needs. I go to a couple other blogs for the humor of the specific bloggers. However, if RC ever shut down, a huge void will be left that will probably be impossible to fill. RC is a blog that provides so much to the anime community. That’s how I truly feel. Simply put, this site rocks!! I’ve been around since nearly the beginning so I really appreciate all the work you put into the site! Thanks for all your dedication. I love this place. Congrats!!! Love this site.. the best blogging site in the world. 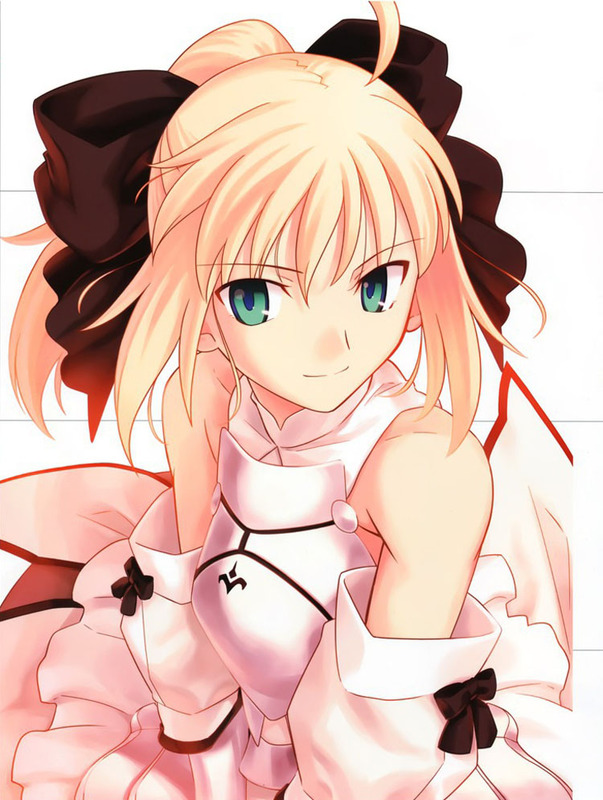 LOL.. Saber Lily pic looks really good too! Good Luck and Thank You RC writers!! This is a “Divine” blogging site! I believe I discover RC back during Bakemonogatari days, when I was searching for a site blogging that show. Since then I regularly visit this site many time a day initially reading new post from bloggers then eventually explored old contents looking for old blogged shows and read them with interest, I actually watched many older shows thanks to the blogs of this site. I don’t post comments very often, but i do visite RC everytime i get my hands on a computer, which is everyday. And I have been doing so since Omni created this site, and been fallowing since Divine took over. You guys are amazing! I watch lots of animes, particularly the ones you guys blog here. Keep up the good work and congrats for the 80 million view! grats on the milestone and too all the bloggers and visitors that made this possible. Awwwwwww shucks Divine, you make me feel all warm and fuzzy inside, lol. Keep up the good work man, many of us appreciate what you and the team do even when we rarely comment. Sorry for never commenting! Just know I really appreciate what you do with this site and it makes watching anime so much more fun and rewarding for me. Thanks for all of you’ve done so far, and I’m looking forward to more! Congratulations on hitting 80 million. Its a richer experience as a whole. More power and thanks for all the hard work! Where would the readers be without your(all of the writers) interesting reviews?Keep at it guys.